It has been months since I have posted here on my tree blog. But, here I am again, with a new drawing to show you! I have been working on a series of flowering trees in the past few months, which has been a joyful experience. 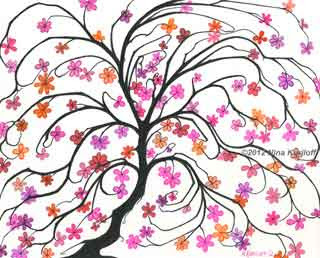 So, here is my large (8 x 10 inch) drawing of a blossoming tree, that I created using pens on paper. I used archival, acid-free and india ink pens to create this piece. This is lovely Nina, are you doing ACEO trees also? I would like to buy one from you. I am happy to hear that, Julie! I will contact you on G+.